Waist ornament comprising a double twisted length of plant fibre cord, knotted together at the top, onto which have been strung 184 blue glass beads. The beads are a mix of short to long cylindrical beads (some with obliquely cut ends), ring beads (with convex sides) and disc beads (with flat sides). The majority are made from an opaque white glass which has an outer coating of turquoise blue (Pantone 325C) to turquoise green (Pantone 3258C) glass; this is probably the type that is known as gwen bor . 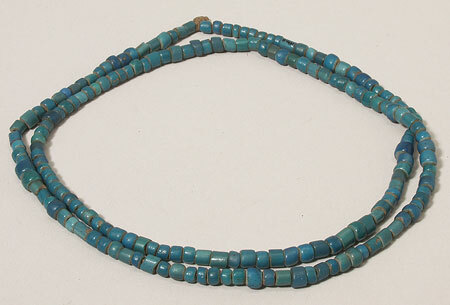 There are about 14 beads in this group which lack this white core - 13 turquoise coloured glass examples, and a bright blue glass bead (Pantone 299C). These probably represent the imitation gwen bor mentioned by the Seligman's in their notes on this object. The string appears to be complete and intact, with a weight of 46.7 grams. It has a length of 430 mm, as strung, while the cord has a diameter of 0.5 mm. The beads themselves are of varying sizes; diameters range from 4.9 to 6.8 mm, and lengths from 4 to 7 mm. "In the afternoon they all came up for farewells. Ikan sent a bowl of honey in exchange for beads. She had given me honey before, & very good it is. Then at the last she took off her waist string of Bor beads & gave them to me. Ibrahim gave me a small sitting stool. A general presentation of beads and salt followed” (based on information collected by Fran Larson from the unpublished diaries of C.G. and B.Z. Seligman, in the Archives of the London School of Economics, Seligman manuscripts, files 1/4/1 and 1/4/6) . The waist string was donated to the Pitt Rivers Museum in August 1946. This type of bead is prized highly amongst the Bor Dinka, and cattle can be bought with them. They can readily distinguish between genuine gwen bor and imitations; however the Lotuko do not object to having a mix of the two in their ornaments, as is the case here. For other beads collected by the Seligmans at the same time, see 1946.8.101.2-7; some of these are now in the British Museum. Accession Book Entry [p. 146] - MRS. SELIGAMN, COURT LEYS, TOOT BALDON. [p. 147] 1946.8.101 - ANGLO-EGYPTIAN SUDAN. LOTUKO-SPEAKING TRIBES. [1 of] Two necklaces strings, 3 short lengths and some loose beads, of greenish-blue colour, including many known as gwen bor, which are very highly valued by the LOTUKO who stole them, according to their DINKA tradition, from the BOR DINKA. They [insert] LOTUKO [end insert] say they went with OMURUK (their name for EMIN PASHA) to BOR & brought the beads back. Among the BOR DINKA they are even more highly prized & cattle can be bought with them. The BOR DINKA can readily distinguish the true gwen bor beads from imitations, the LOTUKO do not object to having others of the same colour mixed with the genuine ones as in these specimens. One of these [.1] is a waist-string given to donor by a woman who was wearing it. They are also worn as anklets. Cf. frontispiece to C.G. & B.Z. Seligman, 'Pagan Tribes of the Nilotic Sudan'. (In glass-topped box). Additional Accession Book Entry [page opposite 147] - one string [1946.8.101.2] and a short length [1946.8.101.5] sent to the British Museum at Mrs Seligman's request [blue ink]. 1946.8.101.7 - An additional short length strung with 7 translucent blue-green cylindrical beads was discovered in the box with this group in 2004. Length string = 35 mm (RTS 30/6/2004) [black ink]. See also Cambridge Museum of Archaeology and Anthropology 1933.600 for a further a string of blue gwen bor beads [RTS 12/8/2004]. Written on object [base of a glass topped box used to store the shorter bead strings and loose beads] - Beads highly valued by LOTUKO & DINKA, including many known by the DINKA as gwen bor, with which cattle may be bought. According to the tradition, the LOTUKO stole these from the DINKA. Some were given to donor by an old LOTUKO woman who was wearing them as a waist string. LOTUKO-SPEAKING TRIBES, ANGLO-EGYPTIAN SUDAN. d.d. Mrs B.Z. Seligman. 1946.8.101 [RTS 21/5/2004]. Sparks, Rachael. "Lotuko waist ornament" Southern Sudan Project (in development). 03 Jan. 2006. Pitt Rivers Museum. <http://southernsudan.prm.ox.ac.uk/details/1946.8.101+.1/>.